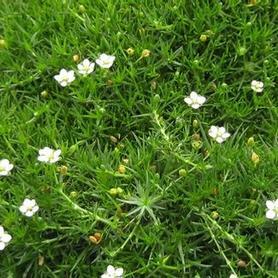 Irish Moss forms an evergreen mat of mossy foliage that is covered with tiny white flowers in May and June. Prefers good drainage. 'Black and Blue' Anise-Scented Sage starts blooming in July and continues until the first frosts. 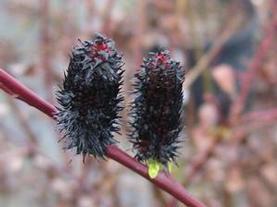 The showy flowers are a deep cobalt blue, set off by black calyces. They are produced in great numbers on long spikes above shiny green foliage. Like other large flowered Salvias, 'Black and Blue' is an amazing hummingbird and Sphinx Moth magnet. 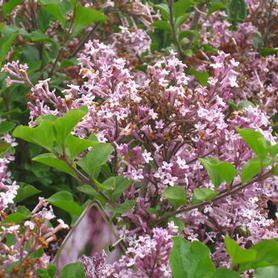 Give it plenty of room in the late summer garden, as it is a sprawler. 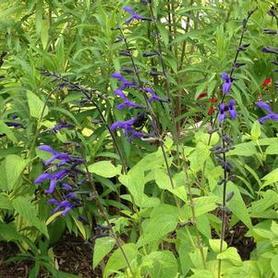 With lots of mulch, Salvia 'Black and Blue' has been known to overwinter in Zone 6 and 7. 'Blue Hill' ('Blauhugel') Hybrid Sage has bright blue flowers June and July and reblooms well if cut back. Habit is compact. Piet Oudolf has used this and other Salvias in masses to create rivers running through his landscapes. 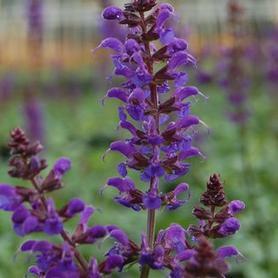 'Caradonna' Hybrid Sage has violet-blue flowers on tall dark purple flower stems, making a very showy combination. From Zillmer Plants in Germany and introduced into this country by super plant dudes, Dale Hendricks and Ron Strasko while at North Creek Nurseries. 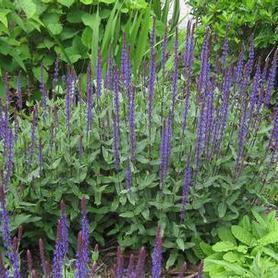 PRN Preferred: Heidi's favorite Salvia because the tall dark purple spikes are so showy. 'May Night' ('Mainacht') Hybrid Sage has purple flowers in May and June and reblooms beautifully if cut back after blooming. 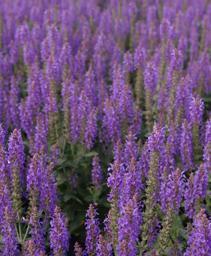 1997 Perennial Plant of the Year, and probably our most popular Salvia. 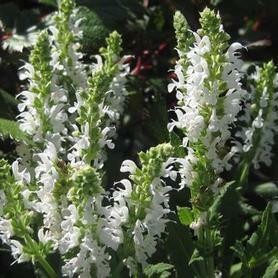 'Snow Hill' ('Schneehugel') Hybrid Sage has white flowers in June and July, and reblooms if cut back after blooming. 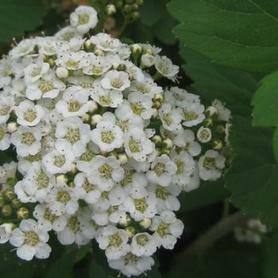 One of the most reliable summer white flowering plants. 'Butterfly Blue' Pincushion Flower has lavender-blue pincushion-form flowers held above clean green foliage in June. Deadhead to get repeat blooms. 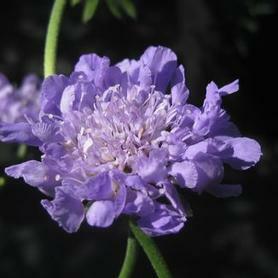 Scabiosa columbaria 'Butterfly Blue' was 2000 Perennial Plant of the Year. Needs good drainage to make it through the winter. 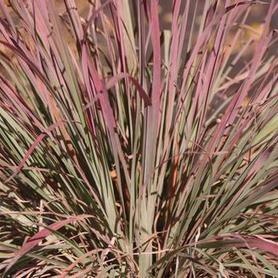 'Carousel' Little Bluestem is a more compact version of our lovely native grass, with beautiful blue-green summer foliage which turns amazing shades of purple and bronze in fall. The delicate seedheads appear in August and September, and are especially showy when backlit by evening sunlight. Plant in excellent drainage for the best performance. 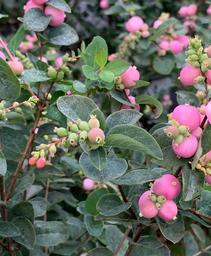 Found by Donald Boehm of Illinois, and introduced by Chicagoland Grows®, so you know it's cold tolerant. All Little Bluestems attract butterflies when in bloom and songbirds when in seed. 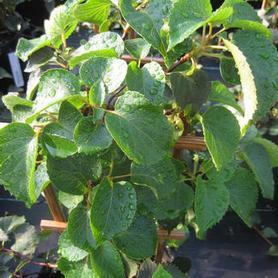 'Moonlight' False Hydrangea-vine has big white lacecap flowers that appear in mid summer, over silver-veined green leaves. 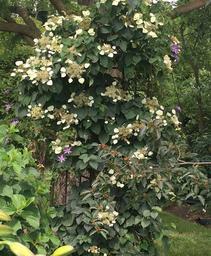 Per Dan Hinkley, soon to be reclassified as a Hydrangea, which makes some sense. Schizophragma hydrangeoides 'Moonlight' is a Barry Yinger find in Japan. 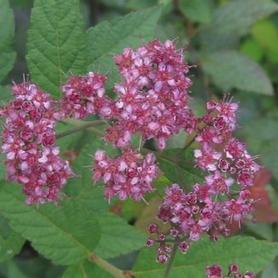 Pink False Hydrangea-vine has pale pink lace cap flowers in mid summer on a slow-growing woody vine. 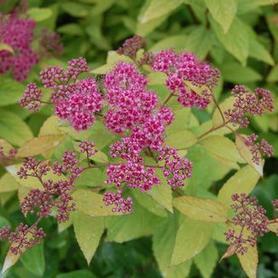 Schizophragma hydrangeoides 'Roseum' is soon to be called a Hydrangea. 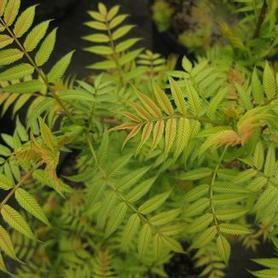 Foliage is a clean dark green. 'Weihenstephaner Gold' Stonecrop is very similar to S. kamschaticum, with delicate yellow flowers produced on lightly serrated green foliage in June and July. 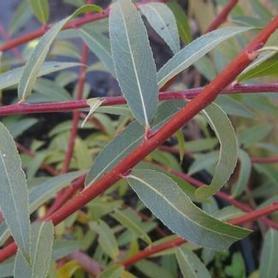 The evergreen leaves take on shades of red in late fall and winter, and form dense mats. Good for rock gardens, walls and dry slopes. 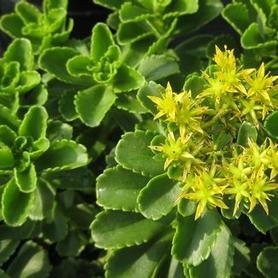 The attractive toothed green leaves of Russian Stonecrop are topped by vivid yellow-gold flowers in June. Makes a good mat for dry places. The foliage of Sedum kamtschaticum becomes bronze in the fall and is evergreen. 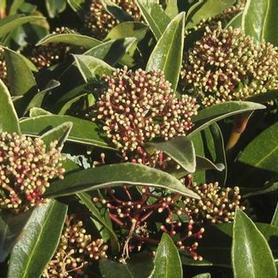 Great for roof gardens, like all the evergreen Sedums. 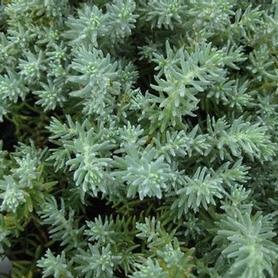 'Blue Spruce' Stonecrop grows in a mat of silvery-blue narrow foliage reminiscent of blue Spruce needles. 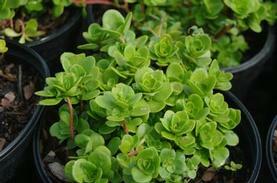 The small yellow flowers appear in July and this Sedum must have a dry, well-drained site. Semi-evergreen. 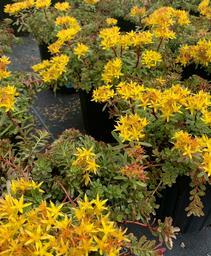 Sedum rupestre 'Angelina' has striking chartreuse to gold needle-like evergreen foliage, topped by inconspicuous yellow flowers in summer. 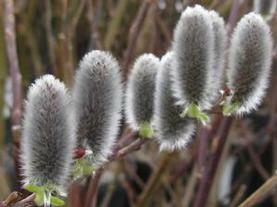 Takes on a reddish tinge on the tips in winter, tolerates dry sites and roots itself easily. Also excellent in containers and roof gardens. 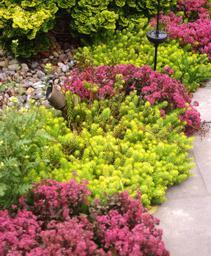 'Dragon's Blood' Sedum or Stonecrop is an excellent groundcover for sunny dry locations. The orange-bronze succulent foliage spreads out to form a tight evergreen mat. 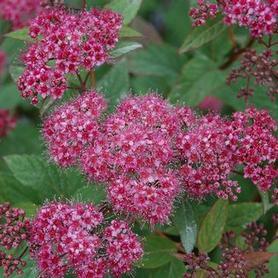 Useful for lining paths, rock gardens and gentle dry slopes, Sedum 'Dragon's Blood' even tolerates dog traffic. 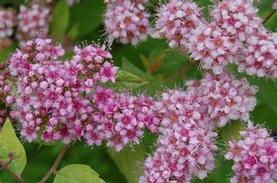 The flowers appear in late summer in attractive clumps of rose red, providing food for bees and other pollinators. 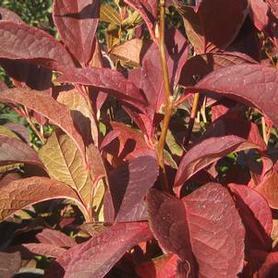 As the days shorten, 'Dragon's Blood' takes on darker red foliage coloration. Sedum spurium 'Fulda Glow' ('Fuldaglut') is an improved 'Dragon's Blood' Sedum, with bronze-red foliage topped by short rose-red flowers in July. 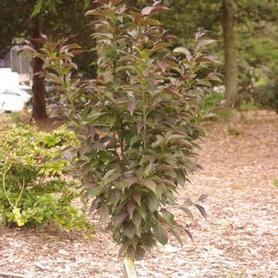 Winter foliage color is bronze-purple. 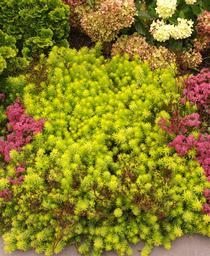 Considered one of the best Sedum groundcovers, especially for roof gardens. 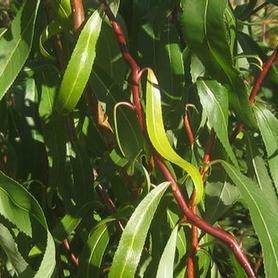 It is evergreen and prefers a dry site. Wild Stonecrop is an unusual Sedum in that it is shade and tolerates more moisture than most Sedums, as well as native. 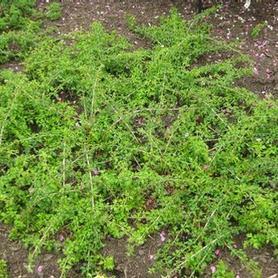 The green succulent foliage is fine, often forming dense groundcover mats. 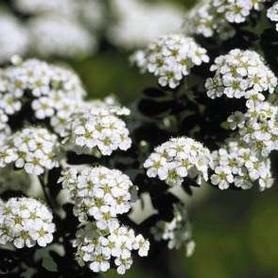 The delicate starry white flowers hover above the leaves in April and May, attracting butterflies and native pollinators. Like other stonecrops, Sedum ternatum is deer and rabbit resistant. 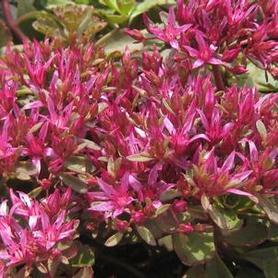 'Autumn Joy' ('Herbstfreude') Showy Stonecrop has rose-pink flowers, blue foliage and needs a dry site to perform best. 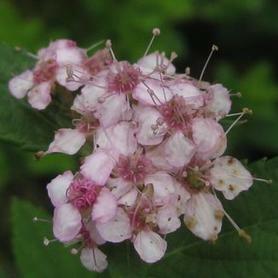 The spent flowerheads remain an attractive tan rose color. 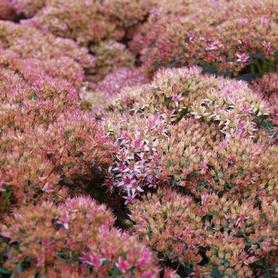 Sedum x 'Autumn Joy' was introduced by Georg Arends of Germany. Our favorite common name for it, 'Pink Broccoli', comes from writer Ruth Clausen. 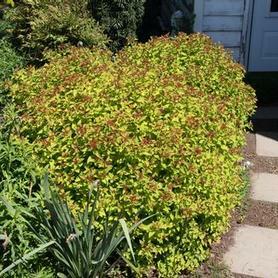 'Dazzleberry' Stonecrop was developed by Chris Hansen, and is the original cultivar of Sunsparkler® Series. 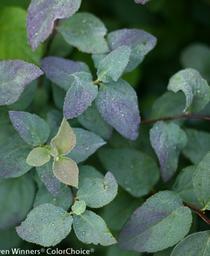 The semi-evergreen foliage makes a beautiful blue-green mat, over which hover the vivid raspberry-pink flower clusters. Sedum x 'Dazzleberry' blooms from mid summer into early fall. 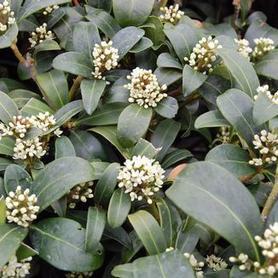 Because of its long season of interest, 'Dazzleberry' makes an excellent plant for mixed containers, as well as a good groundcover for sunny dry locations. 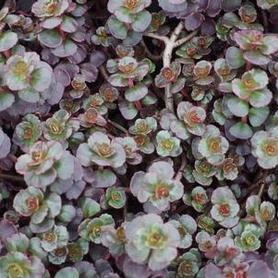 'Matrona' Showy Stonecrop has pale pink flowers and upright purple-gray coarse foliage. Sedum needs a dry site for best performance. This is the largest of the Stonecrops we grow. From Ewald Hugen of Germany. 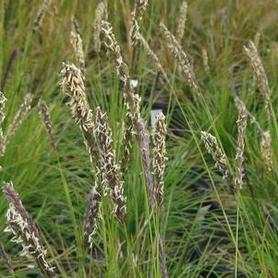 Autumn Moor Grass is a good adaptable short grass that produces chartreuse-green fine foliage topped by delicate creamy seedheads in late summer. 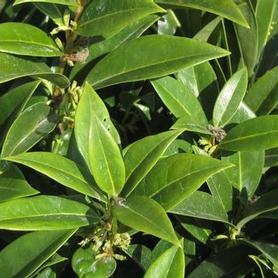 It is happy in both sun and partial shade, and tolerates dry sites. 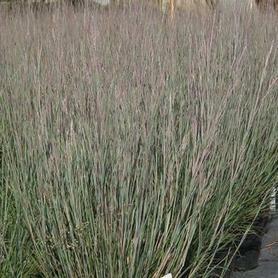 Most effective in large sweeps in the landscape, especially since Sesleria stays green well into late fall. 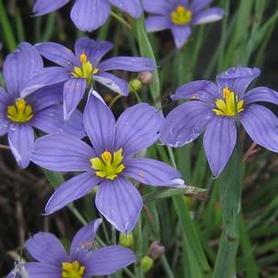 Sisyrinchium angustifolium 'Lucerne' has blue flowers with yellow eyes and blooms most of the summer. This Blue Eyed Grass tolerates dry and salty sites very well and the flowers only open on sunny days. 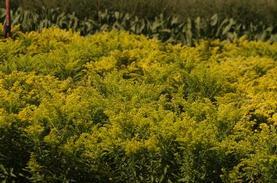 'Fireworks' Rough Stemmed Goldenrod has bright yellow flowers in late summer on a compact slowly spreading plant. 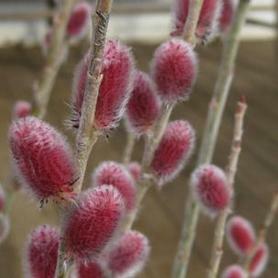 Selected by Ken Moore of the NC Botanical Garden and introduced by Niche Gardens. 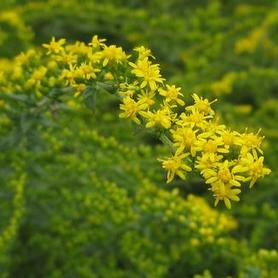 Try Solidago rugosa 'Fireworks' as a cut flower; it is great! An important source of seed for winter birds. PRN Preferred: This is an indistructible native, excellent on dry barren slopes. It can also take wet feet (but not a wet crown). 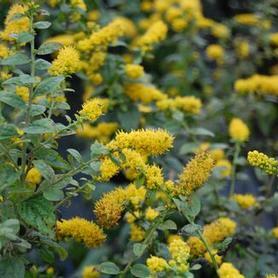 'Solar Cascade' Short's Goldenrod is a named selection of our rarest native Goldenrod. 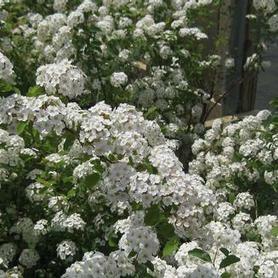 Found only in parts of Kentucky and Indiana, it has great drought and sterile soil tolerance. 'Solar Cascade' was chosen for its showy, cascading yellow flowers, as well as its long bloom period in late summer and early fall. The green foliage is highly disease resistant, so a mass planting of 'Solar Cascade' stays attractive right up until the end of the season. Since it tends to stay in a clump instead of suckering, it also works well in mixed perennial boarders. Hummingbirds and insects love it. 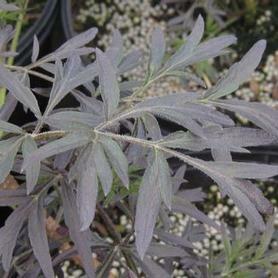 'Golden Fleece' Goldenrod has golden-yellow flowers from mid August to October over semi-evergreen foliage. 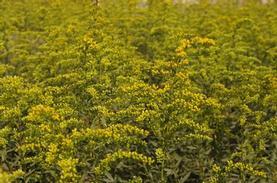 This Solidago spreads to form a tough adaptable groundcover with some shade tolerance. Another wonderful introduction from the Mt. Cuba folks. Winter birds eat the seeds. 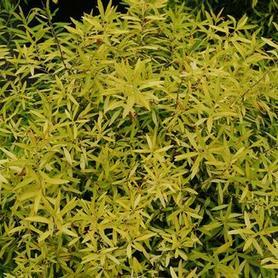 The lemon-yellow flowers of 'Little Lemon' Goldenrod appear in late summer over extremely compact, finely textured foliage. 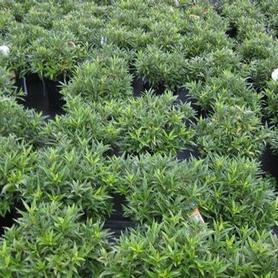 Solidago x 'Little Lemon' was bred originally as a good florist pot plant. 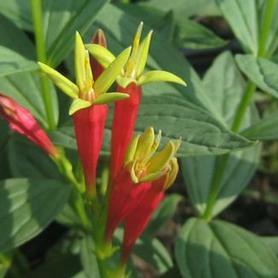 PRN Preferred: Colorful long lasting flowers on a tidy, compact plant. The flowers of Indian Pink are bright red on the outside and lemon-yellow on the inside. A striking combination, especially since the petals curl outward at the ends. Indian Pink blooms in early summer and looks stunning in a mass. 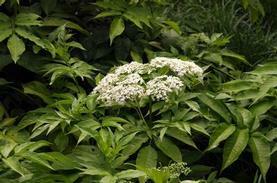 Likes moist sites, but the earlier you plant it in the summer, the better it survives the winter. 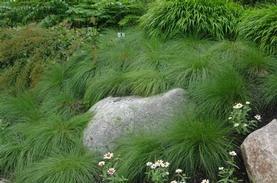 Prairie Dropseed is a green clumping grass with airy delicate panicles held high above the foliage. The fall color is a wonderful orange, changing to cream in winter. 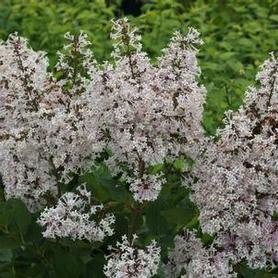 It is extremely tolerant of dry sites, and it has a wonderful flowery fragrance to boot when planted in mass. An important seed source for winter birds. PRN Preferred: What other grass combines beautiful airy seed panicles, showy fall color and great fragrance? 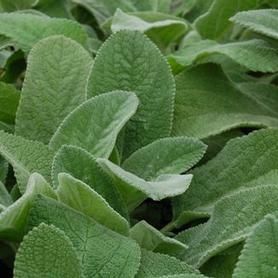 'Helene von Stein' Lamb's Ear has some lavender flowers in June and July over fuzzy silver large-leafed foliage. Stachys byzantina 'Helene von Stein' makes a great dry site groundcover, spreading slowly to cover a large area. 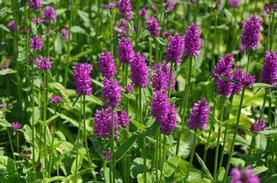 'Hummelo' Alpine Betony was named after Piet Oudolf's hometown. 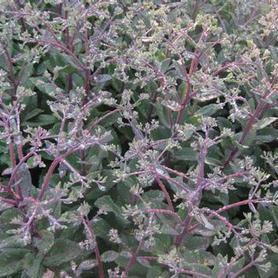 The low growing rosette of textured green leaves is topped by showy spikes of lavender-pink flowers in mid summer for an extended period. Stachys 'Hummelo' is a tough, carefree beauty and used extensively on the High Line Park in NYC. If you haven't gone there yet, go soon! 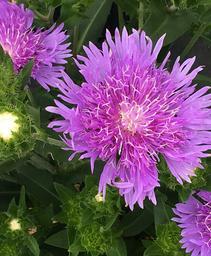 'Peachie's Pick' Stokes Aster was found by Mississippi plants woman Peachie Saxton. Stokesia 'Peachie's Pick' is a compact version of this long blooming native, with large lavender blue flowers. Stokes Asters flower virtually all summer, especially when spent blooms are deadheaded. When established, Stokesia Peachie's Pick is surprisingly drought tolerant and overwinters best in well drained locations.